WTH?! (What the Heck?) moments are attempts to find the memorable and the off-beat perspective on Longhorns sports. 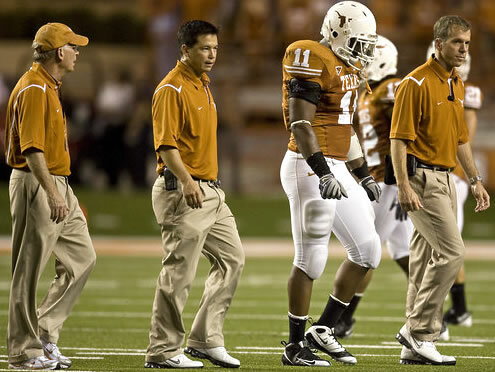 Here are some interesting moments from the Texas’ game against the Missouri Tigers. Pregame WTH McCoy?! Great game by [tag]Colt McCoy[/tag] who finished with 26 of 31 for 269 yards 3 TD’s and 1 interception. He nailed it during the pregame stretching when he was yelling at the team “this is our house, from the very beginning… lets go.” Colt knew exactly what he was talking about by leading the team to three straight scoring drives to put the Tigers away. 1st Quarter (8:08) WTH Mack?! Gutsy call by Mack Brown to order up a fake punt on 4th down on their own 47 yard line. Texas was only up one score and the message that was sent to the Tigers was it was going to be the Horns day. Start of the 2nd Quarter WTH Mizzou fans?! It was Mizzou’s homecoming that they claim to have started back in 1911. Never new a simple call from the office of the president at Missouri to come back and watch a football game was such a momentous occasion. Wow, way to fire up the football fans with bringing out former MU basketball player Steve Stipanovich (1,836 points & 984 rebounds from 80-83). Let’s bring out our stud UT LaSalle Thompson (1,463 points & 1,027 rebounds from 79-82) next time the Tigers come to Austin. 2nd Quarter (:51) WTH Herbstreit?! You may not be good at predicting winners on the Gameday set early that morning in Provo (3-6), but you sure good at predicting UT scores. Kirk Herbstreit was wondering what the score was last year between the two teams at half. As soon as Kirk remembered the score (35-3), UT [tag]Curtis Brown[/tag] broke through to block the Mizzou punt in the end zone which was recovered by [tag]Malcolm Williams[/tag] to make the score 35-7 (eerily similar). Start of the 3rd Qt. WTH ABC?! Great call by the television truck to cue up the Dave Matthews song “Too Much” with highlights from the first half which was all Longhorns. 3rd Quarter (5:45) WTH Smith?! Mizzou’s outstanding defensive player Aldon Smith had a tremendous night (11 tackles and 2 sacks). Too bad he added a bone headed play by hitting Colt out bounds (personal foul – 15 yard penalty) which caused Mack Brown to hyperventilate with the franchise lying on the sidelines. Whole Game WTH Offensive Line?! [tag]Kyle Hix[/tag], [tag]Michael Huey[/tag], [tag]Chris Hall[/tag], [tag]Charlie Tanner[/tag] and [tag]Adam Ulatoski[/tag] who started the game and the rest of the big uglies should be lauded for a physical and dominant performance with the Horns gaining 400 total yards and scoring 41 points. Next up for the Longhorn’s is a visit to Stillwater to take on Oklahoma State at 7pm on Halloween night. Jared Norton reinjured his shoulder against ULM. Just one week into the season and the Horns’ official injury list is already getting a little long, and there’s a familiar name on it that fans were hoping would be a big contributor this year. Four players didn’t make the trip to [tag]Wyoming[/tag] due to various injuries. Running back Fozzy Whittaker is out again this week with a knee injury. Also out are offensive guards [tag]Michael Huey[/tag] with a left ankle sprain and true freshman [tag]Mason Walters[/tag] with a foot injury. Linebacker [tag]Jared Norton[/tag] has a right shoulder injury that reportedly isn’t too serious, but it’s bad enough that he’s out for this week’s game. The offensive line depth is definitely hurting. When the season started the coaches had five starters and [tag]David Snow[/tag] backing them up and now one of the starters is out and another backup is down. [tag]Tray Allen[/tag] was working almost exclusively at defensive tackle last week and this week he’s the number two guy at both left guard and tackle. Hopefully the line and everyone else can stay healthy this week in possibly snowy Wyoming. Everybody knows to look for [tag]Colt McCoy[/tag] and [tag]Brian Orakpo[/tag] each game, but UT’s success in this week’s game against [tag]Rice[/tag] and in the upcoming conference match-ups will hinge on the production and success of a few players that are coming into their own. Let’s look at five. The redshirt freshman tailback was the most productive back in Texas’ offense in his only game this year. His skill set fits in perfectly with the type of offense Texas likes to run. Foswhitt averaged 6.0 yards on 12 attempts against UTEP. He had missed the first game with a knee injury but all reports suggest his knee is fine so expect more touches against Rice. Running backs coach [tag]Major Applewhite[/tag] has been emphasizing receptions out of the backfield, and with Whittaker possessing the best open field moves on the team he seems to be in line to become more and more a part of the offense. I wouldn’t be surprised to see him start, and if he doesn’t start against Rice, he will be by the time Big 12 play begins. The Rice game will be Earl’s third start at safety in college. Rice’s tight end James Casey leads the nation in receptions per game (over 9), and is sure to be Thomas’ man of the night as the defense has seemed to play [tag]Blake Gideon[/tag] in the deep middle. The redshirt freshman has played hot and cold as would be expected in his first two college games, but coach [tag]Will Muschamp[/tag] seems to have confidence in him. If Thomas can hold his own and wrap up when he hits a ball carrier it will help ease the anxiety of a lot of Texas fans. If he can’t, [tag]Christian Scott[/tag] or [tag]Ben Wells[/tag] may get more looks. The young offensive lineman got a chance for major playing time when teammate [tag]Charlie Tanner[/tag] went down with a leg injury. Huey struggled at times against UTEP and must begin to move people off the line in order to hold off Tanner when he comes back as well as true freshman [tag]David Snow[/tag]. Texas wants more push in the run game on the inside. Huey has the raw talent and mean streak to remind many fans of ex-Longhorn, and big bellied cult leader, Kasey Studdard, but must translate it on the field to solidify Huey as a starter for the next few years. Colt McCoy has played great, beyond great really in the first two games, but eventually this team will need a deep threat and the most likely candidate appears to be the 6’4″ Williams. Through the first two games it appears Texas hasn’t even looked to go deep, settling for underneath patters. As the talent of the players, and the coaches, rises the need to stretch the defense takes on added importance. Watching Williams in practice and in pre game warm ups leaves little doubt to his physical skills, but like most young players Williams needs to build his on field confidence by making big plays in a real game. Think of [tag]Limas Sweed[/tag] before and after the catch in the “Horseshoe” against [tag]Ohio State[/tag]. Williams will need a play like that to jump start his season and his career. The best player on Rice’s team is wide receiver Jarrett Dillard and one would think senior cornerback Ryan Palmer will be the guy asked to shadow him throughout the night. The Owls offer little threat on the ground, so the play of the secondary (especially on third down) will be important in preventing any thought of an upset. Dillard and Rice quarterback Chase Clement will finish their careers as the leading touchdown scoring tandem in NCAA history will try to pick on the size of Palmer, but the senior has shown an ability to hold his own against bigger receivers. Holding this group of players in check will serve as a much needed confidence boost heading into games such as OU, [tag]Missouri[/tag], and [tag]Texas Tech[/tag].